QINGDAO: As the eastern shore of Jiaozhou Bay approaches full development - with little land available for further construction - Qingdao city planners "are mapping out a plan to build a new district center around the bay over the next 20 years," Xia Geng, mayor of Qingdao, said in a government work report in January. In a bid to expand its space for growth, Qingdao will develop the area of Hongdao midway along Jiaozhou Bay and Huangdao on the western shore, Xia said. According to the 2006-20 general development plan for the city cluster on the Shandong peninsula, Qingdao will grow into a large city with a population of 10 to 12 million by 2020, with 5 million or more urban residents compared to its current 3 million. Urban residents are crowded on the densely developed east shore of the bay, confined by the water and surrounding mountains and farmland that constrict further expansion. 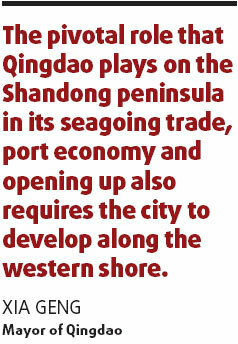 The pivotal role that Qingdao plays on the Shandong peninsula in its seagoing trade, port economy and opening up also requires the city to develop along the western shore, Xia said. Studies by the Qingdao Municipal Development and Reform Commission show that more than 400 sq km - now mostly covered by shallow sea, wetlands and saline marshes - can be reclaimed and developed. Plans call for an eco-coastline along the bay with seven development zones for different business sectors, including conferences and exhibitions in Hongdao, logistics in Huangdao and sites for company headquarters in Sifang and Licang districts. 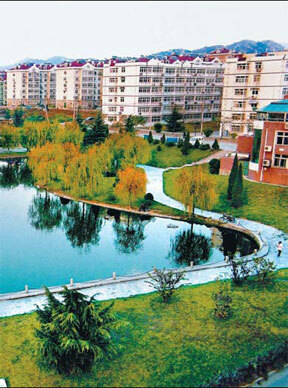 Huangdao is one of the first 14 State-level economic and technology development zones founded after the nation's reform and opening up. The 17.52 sq km zone, with a population of 500,000, has been the recipient of 30 billion yuan for infrastructure construction since it was founded 20 years ago. Its pillar industries are now electronics, petroleum, chemicals and logistics. The western part of Qingdao port in the Huangdao development zone has a yearly throughput of more than 200 million tons of cargo. 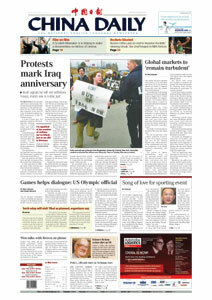 Total revenues from the zone reached 59 billion yuan in 2007. Qingdao is now accelerating construction work on a 3.1 billion yuan underwater tunnel that will connect its urban districts with Huangdao and a 9 billion yuan cross-sea bridge to link urban districts with Hongdao and Huangdao. The two projects will shorten the drive to 20 minutes. "Development of the areas around Jiaozhou Bay will benefit the city in every aspect as it will alleviate the pressure on available construction space, promote the renovation of outdated enterprises, narrow the disparity between the north and south urban districts and balance the development between the east and west around the bay," Zhang Jun, deputy director of Qingdao Municipal Construction Committee, noted. The new construction strategy is also expected to fuel economic growth of Qingdao's satellite cities.